THE DRILL TARGETING THE SWEET SPOTS OF THE EAGLE FORD SHALE Primera Energy is a bonded Texas operator with unique access to promising Eagle Ford Shale prospects. Truck, ship, rail or pipe... weâ&#x20AC;&#x2122;ve got the moves. With a channel depth of 45 feet, authorized and permitted for 52', direct vessel-to-rail discharge, BNSF, KCS and UP on site, dockside truck access, union and non-union stevedore availability, FTZ #122 and the shortest ship mooring time in the Texas Gulf, we get straight to business. Call on your Texas partner. 18	The Southeast Area vice president leads the way with a focus on best-inclass customer service at Halliburton, a cornerstone of global industry. As president of the South Texas Energy & Economic Roundtable (STEER), Omar Garcia is an expert on business opportunities associated with the Eagle Ford Shale who works with the oil and gas industry, local officials, community members, regional stakeholders, educational institutions and economic development organizations to ensure that the natural oil and gas industry in South Texas is advancing in a positive way that is beneficial to both the community and the industry. Garcia has more than 12 years of economic development experience, and he spent two years working for Bank of America as vice president of business development for the bank’s treasury management division. He is a certified economic development finance professional through the National Development Council, and he graduated from St. Edward’s University with a major in international business and Spanish. In 2010, Gov. Rick Perry appointed Garcia to the Texas Economic Development Corporation. Mark Payne is a partner at Burleson LLP, the largest law firm in the nation primarily focused on serving the oil and gas industry. As Payne is a former petroleum geologist and landman, his practice is dedicated to warranty issues, operating agreements, unitization and environmental, including water and air matters. He is on the board of the South Texas Wildcatters, and he is involved in the community with his participation in the San Antonio Chamber of Commerce, Energy and Water Sustainability Section. Jeffrey A. Webb is a senior associate in the San Antonio office of Norton Rose Fulbright, a global legal practice providing the world’s pre-eminent corporations and financial institutions with a full business law service. Recognized for its industry focus, Norton Rose Fulbright is strong across all of the key industry sectors: financial institutions; energy; infrastructure, mining and commodities; transport; technology and innovation; and life sciences and health care. www.shalemagazinetexas.com For advertising information, please call 210.240.7188 or email kym@shalemagazinetexas.com. For editorial comments and suggestions, please call 830.377.8573 or email jimmy@shalemagazinetexas.com. TO REACH US: 5600 Broadway Ave. San Antonio, Texas 78209 Phone: 210.240.7188 Copyright © Shale Magazine. All rights reserved. Reproduction without the expressed written permission of the publisher is prohibited. TANKS Ideally located in Seguin Texas, Tank Partners wants to partner with you. into why that’s important, how it is happening and who the individuals are who do this work every day. The subject of our cover story, Paul Sheppard, Southeast Area vice president for Halliburton, is just one example. 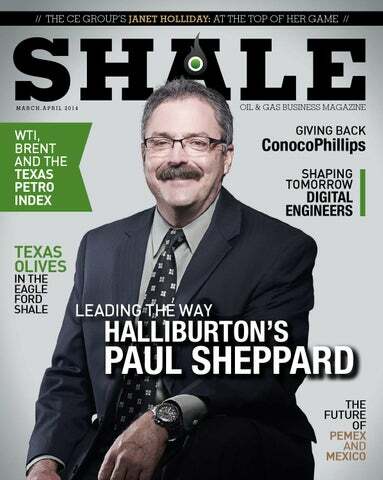 We are so thrilled to have Sheppard featured in this issue of SHALE, and I know you will enjoy reading the article, along with all of the others included. When I founded this magazine, I didn’t know what to expect. I knew it was needed, and I knew it was a good idea, but I had no way of knowing how people would react. I am so pleased at the overwhelming response to this publication, and it inspires all of us at SHALE to work diligently to improve with each issue. SHALE magazine has quickly become the most respected and professional business magazine in its class, and this is truly inspiring to me and to our team. We are very unique in that we have an active advisory board comprised of some of the most distinguished and well-respected individuals in the industry. Our newest board member is Thomas Tunstall, Ph.D., who serves as the research director for the Institute for Economic Development at the University of Texas at San Antonio. He is also the lead researcher of the annual Eagle Ford Shale Economic Impact Report. This report explains not just to the industry, but to the community, the significant positive impact that we all receive from the Eagle Ford Shale. We are extremely proud to welcome him on board and look forward to his contribution as we continue to raise awareness about energy topics to further help businesses, elected officials and the community have a better understanding of the industry. I would like to thank everyone who attended our cover party and made it such a huge success, and I would like to extend a special thanks to Commissioner Porter for his attendance. Be sure to check the Scene section in this issue for pictures from this exclusive event. If you are not attending our events, you are truly missing out on great opportunities to network with industry insiders and decision-makers. On a final note, I am extremely excited about several new plans on the horizon, but one that is extremely important to me is our LinkedIn group, “Oil and Gas Community Speaks” (www.linkedin.com/groups/Community-Speaks-Oil-GasBe-7459341). Please join us on LinkedIn and be part of the conversation. It is not an overstatement to say that the oil and gas industry is the most important industry we have. Energy is the product of your efforts, and without that product, no other industries could thrive. This is a message we all need to repeat. It’s time to take control of the message and bang the drum loudly. One final thank you to our advertisers, to our sponsors and to our readers for your continued support and patronage. We will always work hard to earn your business and your respect. SHALE Oil & Gas Business Magazine is a publication that showcases the dynamic impact of the Texas energy industry. The mission of SHALE is to promote economic growth and business opportunities and to further the general understanding of how the energy industry contributes to the economic well-being of Texas and the United States as a whole. 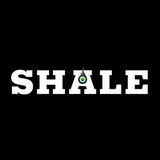 SHALE’s distribution includes industry leaders and businesses, service workers, entrepreneurs and the public at large. James M. Summers joined in San Antonio office of Norton Rose Fulbright in 1976 and became a partner in 1985. He received his undergrad from Southern Methodist University and his law degree from the University of Texas Law School, and he has six professional honors. Summers’ legal practice focuses on real estate and oil and gas matters, which involve the representation of an array of clients who deal with complex and sophisticated financial transactions and situations. Summers represents many financial institutions and private equity groups in the securitization, CMBS and other related loan markets. He counsels clients and is involved in major workout and reorganization matters relating to all areas of real estate. His practice focuses on energy and oil and gas transactions with matters in the Eagle Ford Shale industry, representing everything from acquisitions and dispositions to refineries and solar power facilities. Scott Courtney, P.G., is the president of Premier Hydro, and he has more than 30 years of background, education and experience in oil and gas, water resources, environmental management and business development. He was raised in West Texas, but he has made South Texas his home since 1984 while working around the country in major programs for the Department of Energy, the Department of Defense and the oil and gas industry. Over the last four years, he has focused on the Marcellus, Permian Basin and Eagle Ford Shale plays. He is the 2013 South Texas Wildcatter Committee chairman, and he has made a career of sustainable development and production of natural resources. Kimberly Webb is the business development manager for Chemoil Energy, an oilfield service company specializing in frac fuel operations. Webb is in charge of managing and marketing the Texas region, and she is committed to improving the efficiencies of the oil and gas service industry. Chemoil Energy is a division of Chemoil Corporation that sells and markets fiveplus billion gallons of commodities worldwide. It is the world’s leading integrated producer and marketer of commodities. Thomas Tunstall, Ph.D. is the research director for the Institute for Economic Development at The University of Texas at San Antonio. Previously he was a management consultant for SMEs, and the former Component 1 Team Leader for the Azerbaijan Competitiveness and Trade project. He has also served as an advisor relations executive at ACS, and was the founding co-chair for the Texas Chapter of the International Association of Outsourcing Professionals (IAOP). He has published a business book entitled “Outsourcing and Management” (Palgrave 2007) and was the Technical Editor for “Outsourcing for Dummies” (Wiley 2008). Dr. Tunstall has consulted in both the public and private sectors. In 2006, he taught Ph.D. candidates in a business and government seminar at the University of Texas at Dallas, and in 2005, he completed a long-term assignment in Afghanistan, where he was deputy chief of party for a Central Bank Modernization project. HISTORIC 1878 BUILDING IS LOCATED IN THE HEART OF DOWNTOWN LEADVILLE, COLORADO Historic Rocky Mountain Home. It can be a corporate retreat or large second home. Newly restored & fully furnished. called Lake University (see “Leaders Open Doors” on page 50). Lake Truck Lines is committed to continuing education for its employees, both internally and externally. Currently, the company is covering the cost for two of its employees to attend UTSA. According to Cain, “We are a 64-year-old company, and we are just learning how to learn. I am proudest when I look at my employees and see them working so hard to be better. And I’m right there with them.” When you spend time with Cain, you can’t help but walk away feeling that anything is possible. He has a positive attitude that inspires your imagination, but he also makes you understand that ideas are only as good as the actions that follow. To this particular point, he has a simple recipe for success: “If it is important, you will do it. If it is not important, you will not do it. Make everything important.” That’s a lesson he no doubt learned as a teenager operating a broom and as a CEO charting the way forward for his company. For more information, visit www.laketrucklines. com or email jimmy@ shalemagazinetexas.com. she needed to make a career change. In 1990, Holliday and founding partner, Lainey Berkus, started the CE Group. According to Holliday, the CE Group is a “marriage of logistics, operations and creativity” that is built on relationships and resources. They have six core areas of expertise: 1. Event and production management 2. National sports marketing 3. Destination management 4. Goods collective 5. Venue management 6. Public relations and marketing If you’ve visited the San Antonio area, you have seen the elite work of the CE Group at such events as Síclovía, Luminaria, the San Antonio Cocktail Conference, the Rock ‘n’ Roll Marathon and the grand opening of the Briscoe Museum, just to name a few. While Holliday is a huge reason for the company’s success, she also says it’s because she has “the best team” anybody could ask for. She makes sure that in her company, the employees and their families come first. For instance, she ensures that parents who work for the CE Group don’t miss the important things in their family’s lives like their child’s school play or graduation, which sets them aside from other corporations. They also have a large internship program, with more than 103 interns since 2008, teaching college students “the CE way of doing things,” as Holliday says. For more information on the CE Group, visit www.cegroupinc.net. RLI, A RAIL LINK INTERNATIONAL COMPANY, is a full service shipping and freight handling specialist, offering fully customized and integrated logistics solutions. RLI’s expertise in US-Mexico cross border operations and customs broker services, allows expedited clearance of commercial shipments to and from Mexico. not only for the employee, but also for their family. When I asked Paul Sheppard about the primary key to his success he did not hesitate in his response. “The key to my personal success is having a partner in my wife Belinda who has stood by me every step of the way.” Leading a team of over 4,000 employees in a four‐state region is a major responsibility. Yet maintaining a balanced lifestyle is an important aspect for success. In Sheppard’s spare time he enjoys hunting, college football, and golf. In fact golf is a passion he and Belinda share, but neither of them is the best golfer in the family. That title goes to son Tyler who is pursuing a career as a professional golfer. Maegan is following in her dad’s footsteps pursuing a career in the oil and gas industry as a technical writer for an oil service company. From a borrowed wagon and a team of mules in 1919, to today employing in excess of 75,000 people representing 140 different nationalities and operating in approximately 80 countries, to say Halliburton is an American success story is a staggering understatement. And it’s a fitting tribute that an executive at Halliburton credits his spouse for her vital contributions to his career given the role that Vida Tabor Halliburton, and her wedding band, played in the early days of this great American institution. For more information, visit www.halliburton.com. Note: This article has been reviewed by Halliburton and edited according to the company’s policy and style. Texas Workforce Commission’s Hope Andrade, commissioner representing employers (left); TPCO America Corporation Director of Administration J.J. Johnston and CEO and Chief Site Director Renzhao Bai; Del Mar College Board of Regents members Susan Hutchinson, Jim Boggs, Todd Walter, Sandra Messbarger and Elva Estrada; and Del Mar College President Dr. Mark Escamilla pose with the $117,223 Texas Workforce Commission Skills Development Fund check supporting DMC training for the corporation’s workforce. DEL MAR COLLEGE HAS LONG BEEN THE VENUE OF CHOICE FOR WORKFORCE PREPARATION. Del Mar College President Dr. Mark Escamilla (right) tries out the welding technology program’s high-tech simulator as student Michael Perea assists during the grant announcement made by the Texas Workforce Commission, TPCO America Corporation and Del Mar College. Welders are among the key employees the corporation needs. Del Mar College Nondestructive Testing students demonstrate techniques used to check for weaknesses or cracks in metal. oil and gas producers? With crude oil trading above $90/bbl, operating margins are still good in the Bakken, Permian Basin and Eagle Ford. Natural gas trading below $4/Mcf tightens things up a good bit. Only operators and plays with the lowest find and production costs like the Marcellus Shale can expect strong activity. Activity in the gas window of the Eagle Ford is generally limited to just a few producers who operate lean and mean like Lewis Energy and Pioneer Natural Resources. Commodity prices are only one measure of the health of the industry. In order to get a more accurate picture, the Texas Alliance of Energy Producers (TAEP) and economist Karl Ingham have developed the TPI. The TPI is based on a comprehensive group of upstream indicators, including oil production, price, employment, rig count, drilling permits and other economic measures. According to TAEP President Alex Mills, the TPI for 2013 set an all-time record high. The record continues to grow and has set new marks in the past four consecutive months. Based on the TPI, the health of the industry is very strong and it will continue to grow at a modest to record pace. Understanding commodity prices and industry health is vital for producers and consumers. Knowing the issues that control supply and effect demand allows everyone the opportunity to make good business decisions. Realizing public policy and regulatory restrictions can have a dramatic affect on price should motivate the public to get involved and make your voices heard. That is all for Shale Play! We hope we you find this information useful and informative. Please let us know your thoughts and comments. Shale Play will continue to look into issues that drive the play and keep our economy growing. For more information, contact Scott Courtney, P.G., at scott@shalemagazinetexas.com. has provided a way to revolutionize the way businesses function in the oilfield. What began as a small group of engineers from Weatherford, Okla., has grown into a product with cutting-edge technology to ensure businesses’ goals are achieved. Systems like Fieldbook ERP allow for full control of operations. From an operations and productivity standpoint, this is a game-changer. For additional information about this dynamic software, please visit www.fieldbookerp.com. paving ing IT and emerging engineering analytics. It is now hard to look at a technical team and see who has the computer science degree and who has the petroleum engineering or chemical engineering degree. Some have both. A digital native is a young person who was born after the general introduction of digital technology, and through interacting with digital technology from an early age, has a greater understanding of its concepts. Other sources identify a digital native as a person who understands the value of digital technology and uses this to seek out opportunities for implementing it with a view to make an impact. When we started our careers, we didn’t have much IT at home and we were pretty amazed with the tools the technology department gave us to use. But nowadays, digital natives have spent their entire lives surrounded by commercial IT services. What can these digital natives do at home that they can’t do when they go to work? While we patiently waited for the IT department to give us the next applications and train us how to use them, this generation impatiently demands the latest tools from IT, which they already have at home, and questions why it is taking so long. We have now entered the world of the T-shaped knowledge worker. These individuals are both deep in their professional domain (say petroleum engineering) and have a broad understanding of digital technologies. Much of that experience with digital literacy comes from the use of their smart phone; their interaction with peers on social media (Facebook, LinkedIn, Yammer); and their ability to use the Internet to find information (Google search, YouTube), to use retail services (Amazon, eBay) and to stay in touch with their friends, many of whom they have never met outside of this virtual experience (Twitter). It is a different world out there now. But how is this impacting the oil and gas business? Here are a few observations: » The trend of field automation, real-time systems and earth and reservoir modeling suggests that the digital oilfield is becoming a reality. » New engineers and earth scientists are entering the workforce with high digital literacy (from lifelong experiences with consumer IT and with some training in programming). » Most of the “innovation” comes from end users or consultants, and most of the execution and support details are left to central IT. » But significant gaps continue to surface (lack of reuse, fragile integration, poor data foundation, lack of end-to-end system design). When we started our “digital” careers, we were not supported by the IT function, but by a specialist technology community. For someone starting their career in the industry today, IT is more important than ever, but they may be getting more help from their circle of friends than from any formal IT organization. The reality today is that the digital oilfield is upon us and the future belongs to the digital engineer. THE DIGITAL OILFIELD IS BECOMING A REALITY. For a more complete picture of the digital oilfield, look for a copy of “The Future Belongs to the Digital Engineer,” written by Jim Crompton, M.S. GEOPH, MBA, and Dutch Holland, Ph.D., on Amazon.com. You may also contact the authors at dutch@hollandmanagementcoaching. com and jimc044@aol.com. BRADLEYSÔ INC. SPECIALIZES IN LARGE MOTOR REPAIR AND LOAD TESTING. operating parameters to the end users that will reduce their operating power consumption, increase their equipment reliability and reduce their overall equipment operating costs. Additionally, the recent shift toward reliability-based preventive maintenance practices has led many companies to test their new or repurposed critical application electric motor systems to validate their performance before they go into service or are placed in climate-controlled storage. As Bradleys’ is a company historically focused on electric motor repair rewinds and modifications alongside new motor sales and field installations, the current shale impact demands that Bradleys’ build upon its solid base of experience to offer customers engineering services, product development, manufacturing, testing, reliability, motor and drive installation and field services that can only come from decades of experience and sound business practices. For more information on Bradleys’ Inc., visit www.bradleysmotors.com. U.S. COMPANIES POISED TO MOVE INTO MEXICAN ENERGY INDUSTRY ¡ Mexico’s share of the gulf could hold 29 billion barrels of oil. ¡ In a given year, Pemex spends $30 to $50 billion on equipment and services for capital and operating expenses. ¡ Pemex has dramatically increased its international procurement activities in the past two years, and with the energy reform, it will continue growing. ¡ Pemex relies on international suppliers for roughly half of its purchases, and approximately 70 percent of these suppliers are based in the United States. exico ended 75 years of government control of its vast oil reserves after congress approved on Dec. 18 – the nation’s most significant economic reform since the North American Free Trade Agreement. rels in proven reserves and up to 115 billion barrels in prospective reserves, about half of which are in deep water or shale oil and gas. ¡ Pemex estimates it needs more than $60 billion a year in investment to explore reserves. It currently gets about $24 billion. ¡ There is potential to attract additional investments in shale and ultra-deep waters so that those resources can be exploited. ¡ Mexico is the world’s ninthlargest oil producer, according to the U.S. Energy Information Administration, and it possesses the biggest unexplored crude area after the Arctic Circle. ¡ Mexico’s oil production has fallen 25 percent to 2.5 million barrels per day from a high of 3.3 million in 2004. Should Mexican output reach four million barrels daily by 2025, Mexico could surpass Canada to become the world’s fifth-largest producer, given current production levels. ¡ Natural gas production would almost double to as much as 10.4 billion cubic feet by 2025 from its current output of 5.7 billion cubic feet. ¡ From a value standpoint, the part where there’s the most upside potential is exploration and production (E&P). That’s where the vast untapped reserves are. There will be tens of billions of dollars in investment in the next five years. tional prohibition on granting concessions to private parties for the wheeling and distribution of electricity, as well as for planning and operational control of the National Electricity System (SEN). Therefore, such activities remain exclusive areas for the Mexican state. 3. With regard to “upstream” activities, the state (as the hydrocarbons owner) may perform such activities through allocations with productive state companies, agreements with productive state companies or agreements with private companies. 4. A wholesale power market will be created, in which public and private power generation companies will trade their production. 4. Investment by private parties in E&P activities is allowed. 5. The contractual regime for upstream activities will include, among others, license agreements; production-sharing contracts; profit-sharing agreements; and services agreements. 1. Any activity related to the generation and wheeling of electricity is no longer a state monopoly. Private companies may participate in the generation and wheeling of electricity to be sold to the state under a framework of energy agreements. 2. The state will continue to plan and control the national electricity system and the public service of transmission and distribution of electricity. ¡ There is great opportunity for foreign investment in all aspects of the value chain. 2. All activities related to oil and gas will cease to be state monopolies. The Mexican state will be entitled to execute agreements with private companies regarding upstream, midstream and downstream activities for oil and gas industries. 1. All hydrocarbons will continue to be owned by the Mexican state. THE 2013 ENERGY REFORM WILL PROVIDE GREATER LEGAL CERTAINTY AND TRANSPARENCY. bons may have not been extracted. Appropriate criteria on the calculation and booking of reserves should also be expected. ¡ The Ministry of Finance (SHCP) shall be responsible for establishing the fiscal aspects of the bidding processes and contracts. ¡ The Mexican Petroleum Fund for Stabilization and Development (FMP) shall be created as a public trust fund with the Central Bank of Mexico as trustee for purposes of managing oil revenues. Before the end of April 2014, Mexican congress shall: ¡ Adjust the legal framework in order to establish greater anticorruption control mechanisms. ¡ Establish new faculties for the Ministry of Energy, the Ministry of Finance, the Energy Regulatory Commission and the National Hydrocarbons Commission. ¡ Make all necessary adjustments to the current legal framework in order to implement the provisions set forth in the bill. These amendments include, among others, provision to the following forms of contracts: services (cash consideration), income (consideration as a percentage of the profits), production (consideration as a percentage of production), licensing (onerous transfer of hydrocarbons at wellhead) and any combination of the aforementioned schemes. ¡ Provide the necessary adjustments to the legal framework in order for those agreements entered into by the state with the private sector or with productive state companies, to include provisions of transparency, external audits and public disclosure of consideration, contributions and other payments under such agreements. ¡ Define the legal provisions to regulate the contracting regime for private parties to participate in the construction, maintenance and operation of electrical grids. ¡ Adjust the legal framework before the end of 2014 in order to establish the guidelines for the protection of the environment in all energy-related activities. ¡ The Ministry of Energy (SENER) shall be responsible for awarding oil and gas leases; selecting contractual areas; providing technical design of the upstream contracts; issuing technical guidelines for the bidding processes; and granting permits for the refining and treatment of oil and the processing of natural gas. ¡ The Natural Hydrocarbons Commission (CNH) shall be responsible for implementing E&P regulation; providing technical advice to SENER; compiling geological and operational information; authorizing seismic survey and prospecting; conducting bidding processes and managing awards to private parties for E&P activities; and supervising production plans to maximize productivity. ¡ The National Natural Gas Control Center (CENAGAS) will be established as a decentralized government entity in order to operate the national pipeline system for the transportation and storage of natural gas. ¡ The Energy Regulatory Commission (CRE) shall have the authority to regulate the granting of permits related to the storage, transportation and distribution of oil, gas, refined products and petrochemicals by pipelines. CRE shall also regulate the access of third parties to the transportation pipelines and storage facilities of hydrocarbons and their by-products, as well as their firsthand sales. ¡ The National Agency for Industrial Safety and Environmental Protection is a new agency independent of the Ministry of Environment and Natural Resources (SEMARNAT), which will regulate and supervise industrial and operational safety and environmental protection (HSE). ¡ The 2013 energy reform will provide greater legal certainty and transparency. ¡ It will help adopt better technologies, increase training and promote best industry practices. ¡ It will modernize public companies by opening certain activities to competition. ¡ The reform paves the way for Mexico’s oil and electricity monopolies, Pemex and CFE, respectively, to become “productive enterprises” for private oil companies to explore and produce oil and gas under licenses and production or profit-sharing agreements, and for private power companies to generate and sell electricity. ¡ The energy reform, including the new laws and amendments to the legal framework (including the enactment of the corresponding regulations), is expected to be fully implemented by 2015. For more information, please contact Lawgistic at info@lawgistic.com or visit www.lawgistic.com. Strengthen advocacy: In 2013, STEER made great strides in conveying the facts of shale gas production to local and regional media. STEER shared the positive economic growth trends in the Eagle Ford Shale region, advocated for social responsibility and collaborated with South Texas leaders to identify and share solutions to support and enhance the vitality of the region. In 2014, STEER will continue to increase engagement and grow relationships in communities within the Eagle Ford Shale region, while continuing to educate the public about the oil and gas industry through speaking engagements and community outreach. region. The members of STEER gain from a mutually beneficial relationship with communities in which they have their operations. In 2013, 23 entities joined STEER to maximize opportunities associated with the South Texas energy industry and to share information to become more effective and efficient. If interested in becoming a member, please email STEER at membership@steer.com. Provide education opportunities in the community: In 2013, STEER successfully enhanced awareness of the STEER brand. In 2014, STEER will be devoted to solidifying its mission of education. The areas of education STEER will focus on include the oil and gas industry, issues facing the industry and communities and workforce development. All speaking engagements will reflect the efforts and the importance of these three categories. In conjunction with our efforts to educate, STEER will offer Oil and Gas 101 presentations to area schools providing industry information, workforce development and safety tips. If you are interested in having STEER speak at your next event, please email us at info@steer.com. professionals from STEER member companies with a focus on developing educational fact sheets, sharing positive stories with our audience and engaging in social media. The Stakeholders Relations Committee is led by stakeholder relations and public affairs representatives who are engaged in grassroots efforts in the Eagle Ford region. The Health, Safety and Environment (HSE) Committee will help identify priority issues in the Eagle Ford Shale region, as well as help member companies and those working in the Eagle Ford Shale region carry out new programs to address the health, safety and environmental concerns. And Water Technical experts will manage the Eagle Ford Water Consortium to focus on conservation and efficient use of water resources in the Eagle Ford Shale region. As a leading organization committed to connecting the industry and legislature, academia and the communities throughout South Texas, STEER is wholly invested in achieving these goals in 2014. We look forward to working in partnership with many of you this year. For more information about STEER, please visit www.steer.com or follow us on Facebook (www.facebook.com/steerroundtable) or Twitter (@STEERoundable). The goal of these workshops is to link fleets that are moving to natural gas with fuel suppliers that, either have, or are building, refueling infrastructure. encourage more use of natural gas for drilling equipment and other oil and gas production and exploration activities. The many ways these and other educational entities are responding to the need for skilled workers are exciting – for both the students who are becoming more employable and for businesses that are partnering with districts to ensure that workers meet their needs. Because of the Eagle Ford Shale, not only is the landscape changing, but the way we do things in school is also changing. Preparing students for the jobs of today and tomorrow has become a priority – and isn’t that the way it should be? For more information, contact Dr. Janet Cunningham at jcunningham@edexcellence.org. aren’t the only topics to avoid. Never ask about a candidate’s age, race, religion, gender, national origin, familial status, disability status, veteran status, medical history or other personal information. Questions must be limited to topics that directly impact the candidate’s ability to do the job. While you may believe the job is too physically demanding for a female or an older candidate, unsuitable for a parent with small children or more fitting for a single person due to travel requirements, this is not within your rights to determine or even suggest. Remember: While each manager may interview differently, this is not an area where you can apply your own style or personality. “Laying the cards on the table” or “telling it how it is” might be a good way to cut through the clutter in other areas of life, but this is one situation where respecting the red tape and erring on the side of caution is always best, lest you find yourself faced with allegations of discriminatory hiring practices. Instinct can be something we all rely on in daily decision-making. However, foregoing company procedure in favor of your gut instinct is an unwise hiring practice. Take the time to do your homework. Execute appropriate background checks. Comply fully with I-9 and E-Verify requirements to ensure the candidate is eligible for employment in the United States. Obtain all necessary documentation, credentials and certification information to ensure the candidate is qualified. Check all references and verify employment history. Delaying or failing to complete some of these “formalities” can cost you greatly. THE GREATEST TOOL YOU CAN POSSESS IN PROTECTING YOURSELF AND YOUR BUSINESS IS KNOWLEDGE. prove you took all necessary precautions and “reasonable care” throughout the hiring process. While thorough notes can prove helpful in these situations, they can also cause great harm if they are the wrong kind of notes. Interview notes could be admissible as evidence. It is important that you do not document opinions, observations or concerns that could be seen as discriminatory on a résumé or in your notes. Your documentation should be able to prove that you adhered to the letter of the law at all times. The documentation is, therefore, only as good as your processes. Ensure that your processes are always legally defensible. If you do not have a qualified HR professional on staff, seek guidance from an outsourced HR provider or legal counsel. Be mindful that you must also be above reproach in verbal, printed and electronic communications with candidates. For example, never make promises – verbal or written – that could be perceived as guaranteeing employment. Instead, factual statements about the company’s history or statistical information can be used to illustrate the company’s stability. Though managers are empowered to hire, they are not expected to be experts in this field. Always seek professional guidance in all employment matters. Andy Cullen is a certified personnel consultant who received an MBA with honors from Rutgers University. For additional guidance and solutions, contact Cullen at 830-331-0940 or andycullen20@ gmail.com. HOSTS: LaVernia Municipal Development District has partnered with the Governor's Office of Economic Development & Tourism *Employees, veterans and entrepreneurs will have the opportunity to hear presentations on doing business with the oil and gas industry, as well as gaining access to capital. Douglas Sterling Cain is the president and CEO of Lake Truck Lines and Lake Oilfield Services. For more information, visit www.laketrucklines. com. xperience a customized itinerary and the “Best Quail Hunting in Texas” just 40 minutes northwest of San Antonio in the beautiful Texas Hill Country along the pristine Guadalupe River. Walk up hunts behind world-class pointing and flushing dogs with professional guides assure you of an exceptional day in the field. Also enjoy fast action European-style driven pheasant shoots or Continental shoots - Fly fishing for trout and gunning on three different automatic clay target shooting scenarios. Joshua Creek Ranch is celebrating 24 years of outstanding client satisfaction and earning the designation as a Beretta Two Trident Lodge for Excellence in Upland Bird Hunting. Rose’s Potato Salad INGREDIENTS: 2 pounds potatoes, peeled and cut into bite-size dice 1/2 cup finely chopped bell pepper 1/2 cup finely chopped celery 2 tablespoons minced, drained pimiento 2 tablespoons sweet pickle relish 1 ½ cups real mayonnaise (or more as needed) 2 teaspoons ballpark-style mustard Kosher salt and freshly ground black pepper to taste INSTRUCTIONS: Place diced potatoes in a heavy-bottomed 6-quart pot. Add cold water to cover. Bring the potatoes to a boil over medium heat. Lower heat to a simmer and cook for about 20 minutes, or until potatoes are tender. Drain into a colander and set aside to cool. In a large bowl, combine the bell pepper, celery, pimiento, pickle relish, mayonnaise and mustard. Stir to blend well. When the potatoes are cool, stir them into the dressing. Season with salt and pepper. Cover and refrigerate until ready to serve. This recipe serves 10 to 12. THE OCCUPANTS OF THE HOMES IN MONTE VISTA ARE AS DIVERSE AS THE ARCHITECTURE. of almost all of San Antonio’s older neighborhoods refer to elevation, as in Monte Vista, Alta Vista, Beacon Hill, Alamo Heights and many others? The district encompasses about 100 square blocks where some 3,000 citizens live in some of the most beautiful architecturally designed homes ever built in San Antonio. The area was developed beginning in 1889 when Jay Adams purchased an 18-acre tract of land south of Summit Avenue from the Kampmann estate at a reputed price of $350 per acre. Adams purchased this property, along with an additional 55 acres contiguous to this site, the following spring. This land became known as Laurel Heights, and it is part of the area now known as the Monte Vista Historic District. the district, and San Antonio College is located just south of the Monte Vista boundary. My wife, Linda, and I have lived in Monte Vista for more than 30 years and have owned five different houses in the district. As a realtor and resident, I have noticed something quite unique about many Monte Vista homeowners: When they sell their house, they buy another home in the district. I know this has happened scores of times. There is a sense of “place” in this neighborhood, in part the result of a strong historic preservation association. People enjoy the many neighborhood activities sponsored by the association, which include “Third Thursdays,” where the members are invited to a designated neighbor’s home or business for a social, with everyone bringing a covered dish and a bottle of wine to share. The Monte Vista Historical Association (MVHA) has a Fourth of July event at the Landa Library public grounds each year, with music, food, a pie contest and a parade. Children can romp in the beautiful playground that is open to the public year-round. A ticketed home tour once every two years helps fund neighborhood activities. Many San Antonio residents have been made aware of the district by attending this event, and residents have become lifelong friends after meeting at neighborhood events. When someone refers to Monte Vista, they normally think of the mansions on West Kings Highway, but this historic neighborhood has smaller bungalows, as well as Prairie School, Italianate, Queen Anne, Mediterranean and many other home styles unique to Monte Vista. The occupants of these homes are as diverse as the architecture, and if one loves architecture, one has to love Monte Vista. To learn more about the Monte Vista Historic District, visit www.montevista-sa.org. This article was contributed by “The Old House Lover” Michael Daniels: matching vintage homes with contemporary lifestyles. For more information, email Daniels at mdaniels444@ hotmail.com or visit King Realtors online at www.kingrealtors.com. Plan your getaway to Corpus Christi, and experience a funfilled stay at the Omni Corpus Christi Hotel. Whatever your reason to escape, you’ll enjoy luxurious accommodations, amazing amenities and fine dining, all within steps from your room. Let us elevate your stay to extraordinary. tion. Boot Ranch is at the forefront in meeting this demand,” says Boot Ranch PGA Director of Golf Emil Hale. “A lot of qualities go into making a golf course great. In the case of Boot Ranch, players generally praise the uniqueness of holes, conditioning, challenge, length and history.” A limited number of non-resident memberships are available for those who want to enjoy golf; access to the property’s Club House Village, spa and fitness facilities; and the new Ranch Club featuring four separate pools, an outdoor pavilion for events and parties and soon-to-be-completed sports and tennis courts. Boot Ranch is a premier luxury residential community nestled on more than 2,000 picturesque rolling acres in the Texas Hill Country. The master-planned retreat offers a variety of living options, and the clubhouse features expansive vistas, a spa and casual fine dining. With its Sutton-designed championship course, Boot Ranch has enjoyed placement among the top 10 golf communities in America by Golf Digest, as well as among the top 10 in Texas five times by the Dallas Morning News. For more information on Boot Ranch, visit www.bootranch.com or call 830-997-6200. We invite you to discover all that Boot Ranch has to offer. Please visit us online or call 830.997.6200. Reference SHALE-92013 with inquiries. ConocoPhillips demonstrates its COMMITMENT TO THE PEOPLE of the Eagle Ford area by providing charitable grants to organizations that positively impact the community. ment and growth area for ConocoPhillips,” Black added. “Our support for these communities is just one way we hope to demonstrate our commitment to the people of the Eagle Ford area.” ConocoPhillips has a field office in Kenedy, Texas, which offices approximately 200 employees and contractors. For more information, visit www. conocophillips.com. About ConocoPhillips ConocoPhillips is the world’s largest independent E&P company based on production and proved reserves. Headquartered in Houston, Texas, ConocoPhillips had operations and activities in 27 countries, $54 billion in annual revenue, $118 billion of total assets and approximately 18,400 employees as of Dec. 31, 2013. IN WITH THE NEW The WOMEN’S ENERGY NETWORK of South Texas congratulates its new board and chairs. JOIN WEN OF SOUTH TEXAS FOR THEIR NEXT EVENT! The South Texas Women’s Energy Network will host a networking happy hour celebrating pioneering women in energy during Women’s History Month! Meet and network with other women in the energy industry. The WEN South Texas chapter brings women together to energize, empower and support one another, while striving to make a difference within South Texas. For more information on WEN of South Texas, visit www.womensenergynetwork.org. Eagle Ford Center for Research, Education and Outreach This workshop will provide an opportunity for elected officials, local governments, emergency responders, school personnel, and land owners to increase your knowledge of pipeline safety and public awareness programs. Operators are invited to display your Eagle Ford Shale operation maps. is dedicated to helping San Antonio and the oil industry with their real estate needs. If you are looking to buy or sell a property, call us and say you saw it in SHALE MAGAZINE! Need to get your message out and engage the community? Let us help! We can put you in front of tens of thousands in the oil and gas community almost immediately, and for the right price, too: free. SHALE Oil & Gas business magazine is an industry publication that showcases the significance of the South Texas petroleum and energy markets. THE DOWNTOWN SAN ANTONIO LIGHTS provided the perfect backdrop for the January/February SHALE magazine cover party honoring Texas Railroad Commissioner David Porter at the Palm Restaurant. In addition to Porter, the evening’s guest of honor, other dignitaries included State Sen. Carlos Uresti and STEER President and CEO Omar Garcia. SHALE magazine Publisher and Founder Kym Bolado presided over the evening. Several companies were represented at the event, including Marathon Oil, Don Strange of Texas, Premier Hydro, Morgan’s Wonderland, Direct Current, Jackson Walker LLP, MassMutual, Lake Truck Lines, Duable and Barrett Jaguar, among others. The event was sponsored by the Palm, Boot Ranch, Texas Energy Advantage and STEER. 1. The freshness of the ingredients 2. The creativity of the dish 3. The amazing reaction you will have that results from the previous two when you take your first bite The name literally means “green grocer,” and the look pays homage to the Mexican “Tree of Life” drawings on amate (bark) paper hanging on the walls. The space also echoes a Mexican botanero, which is a casual space where people gather after work to get botana-style Mexican tapas and cocktails. The drink menu includes a well thought-out list of the aforementioned tequilas from various regions and a variety of traditional fruit-infused cocktails. The juices are freshly squeezed, and the drinks are as unique and delicious as the food. The Frutería is located at 1401 South Flores in San Antonio on the first floor of the Steel House Lofts building. It is another great restaurant from the creative genius of Chef Johnny Hernandez. For more information on the Frutería, visit www. thefruteria.com. DEL MAR COLLEGE Corporate Services provides	customized	training	for	large	and	small	businesses	connected	to	industry. MEXICO’S ENERGY REFORM PETROLEUM CONNECTION hosts the Unconventional Opportunities Mexican Symposium. etroleum Connection’s Unconventional Opportunities Mexican Symposium was held on Tuesday, Jan. 7, high above the city of Houston at the Petroleum Club. Topics ranged from economic overviews, logistics and infrastructure to a review of the legal aspects pertaining to the historic energy reform laws championed by President Enrique Peña Nieto. Featured speakers included Congressman Javier Trevino, secretary of the House Energy Committee, Mexican Federal Congress; Arturo Henriquez, president and CEO of PEMEX Procurement International; and Jorge E. Lopez-de-Cardenas, director of Technology Mexico and Central America Schlumberger.